Ghiandonata gneiss looks coarse, big texture and markedly augen, shows a shade of dark background, due to the biotite. It is not a suitable stone to polishing and lends itself well to smoothing that enhances its beauty. 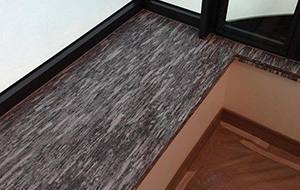 The extraction of this stone is quite limited and makes it a unique and special, to be used in construction as outdoor and interior stone.